Air pollution in the Chinese capital of Beijing and neighboring Tianjin and Hebei was heavier than in other parts of the country in February, the environmental watchdog announced on Tuesday. In the 13 monitored cities in the region, an average of 68.5 percent of the days in February failed to meet the standards set by the Ministry of Environmental Protection. The 74 major Chinese cities monitored nationwide had on average nearly 40 percent of the days in February failing to meet ministry standards, according to the report. 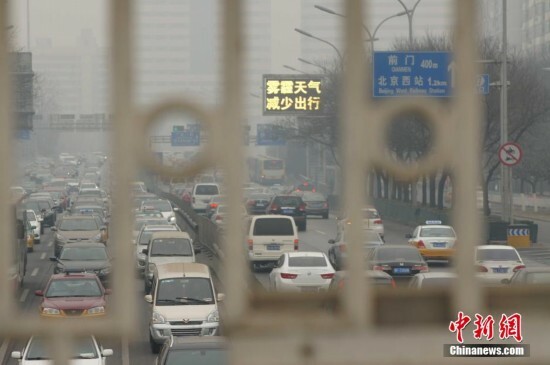 The 10 cities with the most serious problem last month were Xingtai, Shijiazhuang, Baoding, Tangshan, Handan, Xi'an, Langfang, Hengshui, Jinan and Beijing -- seven of which are located in north China's Hebei Province. The ministry said that PM2.5 -- airborne particles measuring less than 2.5 microns in diameter -- was the major pollutant on nearly 92 percent of the polluted days. East China's Yangtze River Delta and South China's Pearl River Delta had more clear days than other parts of the country, with 68.6 percent and 91.6 percent meeting the standard respectively in February. The frequent occurrence of smoggy days since last year has prompted authorities to take serious action in tackling air pollution as it has become a main source of complaints and frustration among urban residents. To address public concerns, the Chinese government aims to cut the density of inhalable particulate matter by at least 10 percent in major cities by 2017.